Tar (Tape Archive) is a popular file archiving format in Linux. It can be used together with gzip (tar.gz) or bzip2 (tar.bz2) for compression. It is the most widely used command line utility to create compressed archive files (packages, source code, databases and so much more) that can be transferred easily from machine to another or over a network. In this article, we will show you how to download tar archives using two well known command line downloaders – wget or cURL and extract them with one single command. 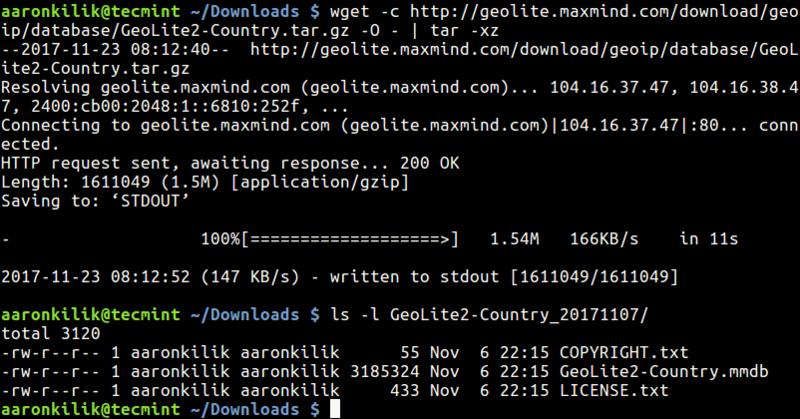 The example below shows how to download, unpack the latest GeoLite2 Country databases (use by the GeoIP Nginx module) in the current directory. 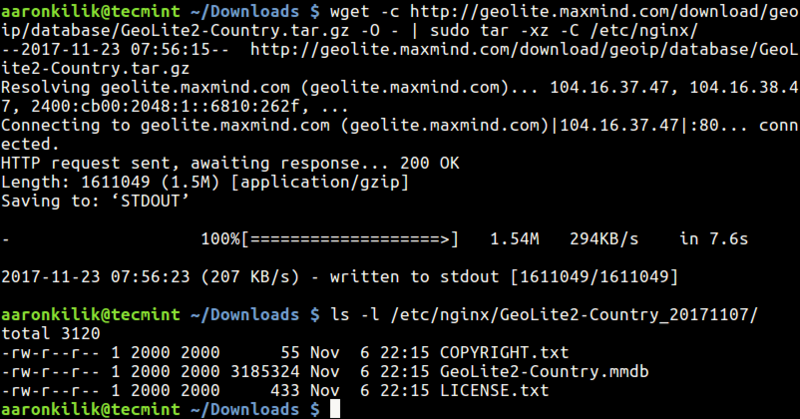 The wget option -O specifies a file to which the documents is written, and here we use -, meaning it will written to standard output and piped to tar and the tar flag -x enables extraction of archive files and -z decompresses, compressed archive files created by gzip. To extract tar files to specific directory, /etc/nginx/ in this case, include use the -C flag as follows. Note: If extracting files to particular directory that requires root permissions, use the sudo command to run tar. Alternatively, you can use the following command, here, the archive file will be downloaded on your system before you can extract it. To extract compressed archive file to a specific directory, use the following command. Considering the previous example, this is how you can use cURL to download and unpack archives in the current working directory. To extract file to different directory while downloading, use the following command. That’s all! In this short but useful guide, we showed you how to download and extract archive files in one single command. If you have any queries, use the comment section below to reach us.